The Sacred Cenote at Chichen Itza. The Sacred Cenote (Spanish: cenote sagrado, American Spanish: [ˌsenote saˈɣɾaðo], "sacred well"; alternatively known as the "Well of Sacrifice") refers to a noted cenote at the pre-Columbian Maya archaeological site of Chichen Itza, in the northern Yucatán Peninsula. It is located to the north of Chichen Itza's civic precinct, to which it is connected by a 300-metre (980 ft) sacbe, or raised and paved pathway. According to post-Conquest sources (Maya and Spanish), pre-Columbian Maya sacrificed objects and human beings into the cenote as a form of worship to the Maya rain god Chaac. Edward Herbert Thompson dredged the Cenote Sagrado from 1904 to 1910, and recovered artifacts of gold, jade, pottery, and incense, as well as human remains. A study of human remains taken from the Cenote Sagrado found that they had wounds consistent with human sacrifice. "Into this well they have had, and then had, the custom of throwing men alive as a sacrifice to the gods, in times of draught, and they believed that they did not die though they never saw them again. They also threw into it a great many other things, like precious stones and things which they prized. And so, if this country had possessed gold, it would be this well that would have the great part of it." Orange-peel dredge used by Thompson 1904-1910 to excavate the Sacred Cenote. In 1967-1968, Norman Scott and Román Piña Chán led another expedition. They tried two new methods that many people had suggested for a long time: emptying the water out of the cenote and clarifying the water. Both of these methods were only partially successful. Only about 4 metres (13 ft) of water could be removed, and the water was clarified for only a short amount of time. 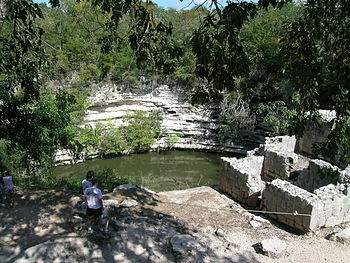 Certain cenotes contain a large number of human remains, including both males and females, and young children/infants. According to archaeologist Guillermo de Anda of the University of Yucatán, evidence from Mayan mythology suggests that many young victims (most aged 6 to 12) were male. While the classical images of a female Mayan sacrifice being flung alive to drown in a cenote are pervasive, Guillermo de Anda's writings on the subject suggest that most sacrificial victims — juveniles who were either purchased or captured while their parents were working in the fields, warriors captured in battle, or elites captured during conflicts with neighboring clans — were usually (though not always) killed prior to being thrown into the cenote, and in many cases, dozens of miles from the cenotes in which their bodies were eventually deposited. He also notes that only a certain set of cenotes was used in this way, while others were reserved for domestic purposes (de Anda 2007). This suggests that Mayan religious officiants believed that only certain cenotes led to the underworld, and sacrifices placed in others would serve no purpose. It also suggests that the status of the victim as alive or dead was unimportant. The occasional appearance of human remains in non-sacrificial cenotes can be attributed to rare errors in judgement on the part of the shaman. The actual pattern by which a particular victim's remains became interred in which cenotes remains a subject of conjecture. ^ a b c Cano 2002, p.85. ^ Kristin Romey (2005). "Watery tombs". Archaeology. 58 (4): 42–49. JSTOR 41781013. Adams, Richard E.W. (1991). Prehistoric Mesoamerica (Revised ed.). Norman: University of Oklahoma Press. ISBN 0-8061-2304-4. OCLC 22593466. Cano, Olga (January–February 2002). "Chichén Itzá, Yucatán (Guía de viajeros)". Arqueología Mexicana (in Spanish). Mexico: Editorial Raíces. IX (53): 80–87. ISSN 0188-8218. OCLC 29789840. Coggins, Clemency Chase (1984). Cenote of Sacrifice: Maya Treasures from the Sacred Well at Chichen Itza. Austin, TX: University of Texas Press. ISBN 0-292-71098-4. Coggins, Clemency Chase (1992). Artifacts from the Cenote of Sacrifice, Chichén Itzá, Yucatán: Textiles, Basketry, Stone, Bone, Shell, Ceramics, Wood, Copal, Rubber, Other Organic Materials, and Mammalian Remains. Cambridge, MA: Peabody Museum of Archaeology and Ethnology, Harvard University; distributed by Harvard University Press. ISBN 0-87365-694-6. OCLC 26913402. Landa, Diego de (1941). Alfred M. Tozzer (trans.) (ed.). Landa's Relacion de las Cosas de Yucatan: A Translation. Cambridge, Massachusetts: Peabody Museum. OCLC 625693.